MIT Global Shakespeares co-founder and co-editor Alexa Alice Joubin has published a new book, Race, with postcolonial theorist Martin Orkin. 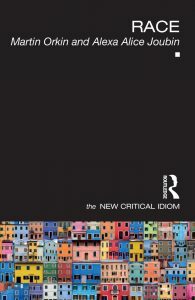 The book is part of Routledge’s New Critical Idiom series. The series emphasizes clarity, lively debate, and original and distinctive studies of important topics by leading scholars. When confronted with the unknown, many societies tend to transfer observations of unfamiliar phenomena onto their mental map of what is already known. Race as a category is entangled with empirical knowledge, misinformation, and ideology, all of which seek to justify and sustain particular beliefs. Knowledge about otherness is socially constructed. Knowledge of race results from taxonomical observations made for colonial, medical, bureaucratic, or other purposes such as political movements.This knowledge is often articulated in the form of inaccurate stereotypes deriving from perceived behavioral patterns, political shorthand that condenses biological features such as skin color and other bodily characteristics, racialized cultural artifacts such as hip-hop or chopsticks that are associated with particular groups or cultures, and check boxes on government forms that require information that encode racial characteristics. In the context of asking for hospitality and for accommodation from their newly found local communities, diasporic and intercultural subjects face a dilemma, because they are caught between pursuing authenticity and “selling out.” A recent example of the Royal Shakespeare Company’s (RSC) English-language productions of two plays, one Chinese and the other Shakespearean, have reignited debates about cultural authenticity. The first is Gregory Doran’s adaptation of Orphan of Zhao with an almost exclusively white cast of 17. British actors of East Asian heritage have spoken out against the practice of what Doran calls “non-culturally specific casting,” or colorblind casting. The politics of recognition can be a double-edged sword. One the one hand, intercultural theatre is an important testing ground for ethnic equality and raises equal employment opportunity questions in the UK. On the other hand, we might pose the following question: can an all-white cast not do justice to the Orphan of Zhao just as a performance of Richard III by an all-Chinese cast performed at the London Globe and in Beijing cannot? We may go on to ask: why would an English adaptation of a Chinese play have to be performed by authentic-looking East Asian actors? Another production that poses relevant questions is Iqbal Khan’s Much Ado About Nothing that was set in contemporary Delhi and staged at the Courtyard Theatre in Stratford-upon-Avon in August, 2012. In her essay in the RSC program, Jyotsna Singh reminds the audience that “the romantic, sexual and emotional configurations underpinning the centrality of marriage in Shakespeare’s romantic comedies” are elements that “richly resonate within the Indian social and cultural milieu.”71Clare Brennan, writing for the Guardian, believed that the transposition of Messina to contemporary Delhi worked well, because it “plays to possible audience preconceptions about the communality and hierarchical structuring of life in India that map effectively onto similar structuring in Elizabethan England.” Performed by a cast of second generation British Indian actors to Bollywood-inspired music as part of the World Shakespeare Festival (WSF), the “postcolonial” production (in Gitanjali Shabani’s words) was quickly compared by the press and reviewers to the two more ethnically authentic productions at the Globe from the Indian Subcontinent (Arpana Company’s All’s Well That Ends Well directed by Sunil Shanbag in Gujarati, and Company Theatre’s Twelfth Night directed by Atul Kumar in Hindi). Cultural, linguistic, and ethnic pedigrees are part of the picture, but some critics questioned the RSC’s type of internationalism. Birmingham-born director Khan’s treatment of Indian culture was regarded as too simplistic in that it occluded historical differences, and modern cultural complexities of hybrid Anglo-Indian identity. It should be pointed out that Khan resisted the perception that his production offered “any kind of Best Exotic MarigoldIndian Shakespeare experience.” RSC artistic director Michael Boyd suggested to Khan that one possible concept for the production might be an adaptation in “an Indian setting” since it was to be part of the WSF. It was clear, however, that the possible direction of adaptation was never to be a “condition of employment” of Khan who wrote that “all my experiences of Shakespeare as a practitioner before Much Ado had little to do with being Asian.” There was, nonetheless, clearly a gap between the production’s intention and its reception by the general public and media.